Weld County Fiddle Fest, 525 N. 15th Ave. Registration: 9:00 a.m. Contest begins: 11:00 a.m.
Sunday! Registration: 9:00 a.m. Contest begins: 11:00 a.m. Registration: 12:00 noon Contest begins: 1:00 p.m.
Mercury Cafe, 2199 California St.
Square Dance & Silent Auction Bring your fiddles, rosin up your bow and get on your dancing boots. COTFA is sponsoring an old fashioned square dance with live fiddle music & a caller. No previous square dance experience required! COTFA is also holding a silent auction fundraiser. Check out the goodies you can take home with the right bid! 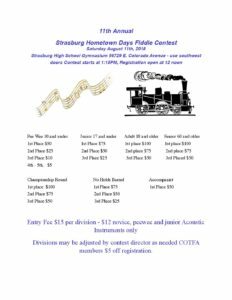 All proceeds go to COTFA, a 501(c)(3), to support the Colorado Fiddle Championships. 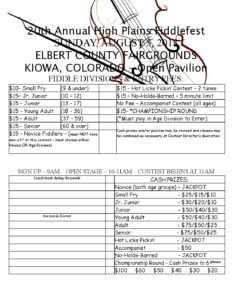 Colorado Fiddle Championships, 4655 Humboldt St.
Mark your calendar for the 17th Annual Colorado Fiddle Championships, January 12-13, 2019!